ALBUQUERQUE, N.M. — On a drive around Sandia National Laboratories, ecologist Jennifer Payne sees more than wide-open desert, grasslands, cacti and dirt. She notices tiers of soil that have experienced stress, looks closely at the height and spacing of vegetation and recites the Latin names of native New Mexico plants and where they belong. Payne is a Sandia ecologist who stabilizes degraded campus lands. She is also one of two Certified Ecological Restoration Practitioners in New Mexico, a title held by only 150 people in the country. She was awarded the certification in 2017 by the Society for Ecological Restoration. Having an ecologist specializing in restoration ensures Sandia upholds commitments to protect land leased from Kirtland Air Force Base, and land withdrawn from the U.S. Forest Service. 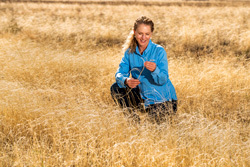 Driving to a restoration project, Payne pulls over her truck, grabs a plastic cup and runs out to capture and move a tarantula from the road to a safe spot among native grasses. Sandia lands are home to lizards, snakes, birds and other wildlife that ecologists monitor and protect. 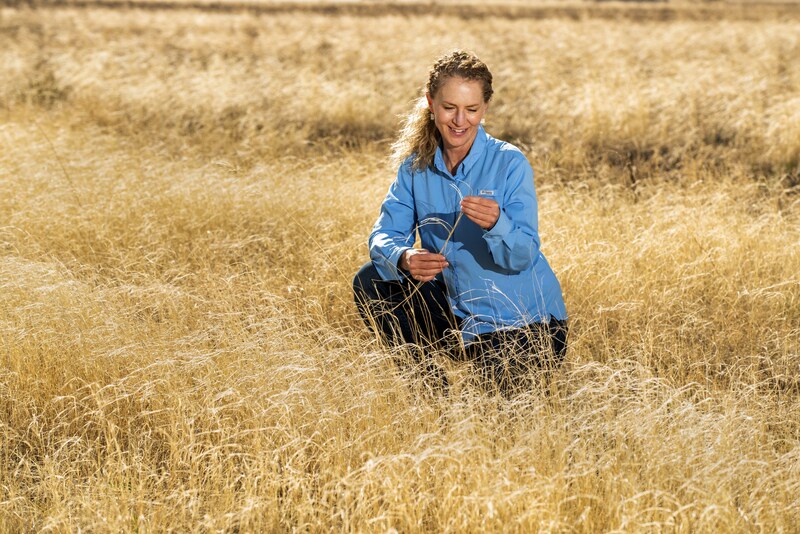 Sandia National Laboratories ecologist Jennifer Payne examines native vegetation planted to stabilize soil in the area following a construction project. Having an ecologist who specializes in restoration ensures Sandia upholds commitments to protect leased land. Payne is one of two Certified Ecological Restoration Practitioners in New Mexico, a title held by only 150 people in the country. (Photo by Randy Montoya, Sandia National Laboratories) Click on the thumbnail for a high-resolution image. Sandia construction projects larger than an acre must have a Stormwater Pollution Prevention Plan and comply with a permit issued by the Environmental Protection Agency. Stormwater runoff from construction sites can cause significant erosion and degradation of local water bodies due to sedimentation, Payne said. These EPA project permits can’t be terminated until 70 percent of the pre-existing native vegetation cover has been reestablished across the project area, or the soil is stabilized with gravel. While complying with the permits is not unique to Sandia, the ecology team works to revegetate rather than just pour rocks. Native vegetation is incredibly resilient, and it provides permanent soil stabilization without ongoing maintenance, she said. It can withstand weather extremes from droughts to intense monsoon seasons, and frigid temperatures to heat waves. It’s also better for animals. Walking through a field at the base of the Manzano mountains, Payne stops to examine native grasses planted in an area where heavy equipment was used to cleanup large concrete structures. She created a reseeding plan for the area and now the new grass blends in. At any given time, Payne works on multiple restoration plans and monitors sites that have been reseeded. She said when a project requires a Stormwater Pollution Prevention Plan and reseeding, Sandia’s stormwater program will let her know. Each site has a slightly different methodology applied to it based on project constraints, microclimates, slopes and other project-specific factors, Payne said. Restoring degraded sites in central New Mexico is extremely challenging, as the area only receives an average of 9 inches of precipitation per year, experiences drying winds in the spring and has hot summers and cold winters. Her plans for each site are provided to Sandia’s facilities group that hires subcontractors to perform reseeding work. Because she’s not completing the hands-on reseeding, her plans must be extremely specific. Kay added that everyone involved is very thoughtful and careful about the way Sandia completes revegetation. “I think people would be surprised and impressed to know the lengths we go to protect the environment,” Kay said.